The most general category after “uncategorized.” Articles on the meaning, purpose and practice of Christian mission, and ours in particular. Repairs of the Youth Club continue – needing about $4,000 to finish and open. And a…suicide note. Short-term Mission team from Wales and England (August 31-Sept. 8) – Our friends from Wales, Ann, Warren, Rosi and Bethany, came out to visit us and introduce us to two new ladies: Allison Todd and Laura Jones. Allison and Laura live in Bath, England, and work with churches and youth in the Philippines. Their heart for the forgotten and unwanted-ones and determination to show Christ’s love in tangible ways marks their way of life and ministry. A friend of theirs from church has a house in a Bulgarian village about 50 kilometers from Veliko Turnovo. After watching the British documentary on the state of care in homes for abandoned and mentally/physically disabled children in Bulgaria, his heart was moved to ask Allison to use his house to better the life of children. Through an amazing connection, our Welsh friends were able to bring Allison and Laura over so that we could all together go and visit the village house. We spent some time in prayer and a lot of time getting to know each other. It looks like God has knitted our hearts and we will be embarking on a new adventure together. The idea as it stands is to use the house as a summer camp for poor and underprivileged children, with the hope that we can run some special camps for orphans and abandoned youth. Please pray for this work – it has exciting possibilities. Viktor speaks at a homeschooling conference (Sept. 27) – Vik was invited as a speaker at an annual gathering of Bulgarian homeschoolers. He spoke on the legal and theological aspects of homeschooling. 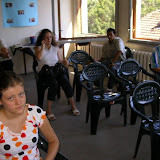 Vik connected with Bulgarian Christian families who had chosen to educate their children at home against all odds and pressure. The event was held in Kotel, a small town in the mountain in the eastern part of the country. The bus trip was about 6 hours but well worth the effort. This was a time of encouraging believers in their responsible choices for the future of the children to be educated and raised in the faith. We feel that this was a great connection in the future of our work for the gospel in the nation. Our visit to the UK for an International School of Ministry at Shaftesbury (Sept. 28-Oct. 13) – We had the privilege to be invited by some new friends (Allison, Paul and Laura) to Lox Lane Christian Centre near Shaftesbury to take part in an international conference. We traveled along with Yavor and his family and had the unique opportunity to be stretched by God together, worship, pray and make new friends from around the world together. We can honestly say that we had no clue what God had in store for us in England and rather thought it would be a nice time of rest away from Bulgaria and the usual grind of life. God, however, was up to something good! We returned blessed in many ways, but these two stand out: 1) God showed each of us people we needed to forgive. God was cleaning up our hearts. 2) We’ve returned home feeling that there is a larger community around us. Meeting new people both at Shaftesbury and Bath who have a heart for us and our work in Bulgaria has encouraged us and we are looking forward to the ways in which God will bring us to work together for His Kingdom here. One of the revelations we received in the UK was that ministry for God should not be performed as a working animal but it should flow from our identity as sons, adopted in God’s family. Issue 17 of Freedom for All – This latest issue focused on the media’s intolerance toward what they deem to be “sects”. The media sensational coverage of “totalitarian sects,” another term for evangelical Christians, has picked up again in the last years. TV morning shows and low class “investigative journalism” continue to depict any minority religious group as the source of evil in society. Instead of focusing on the real societal issues – like corruption, the fusion of organized crime and the government (read the recent New York Times article Mob Muscles Its Way through Politics In Bulgaria, here – http://www.nytimes.com/2008/10/16/world/europe/16bulgaria.html) – the media often comes up with presenting scary pictures of people’s religious beliefs. They even accuse “the sects” of “horrendous crimes” and “convincing people to commit suicide” without any proof or evidence. This sensationalist tactic is against the main laws of the country, which is EU member, but the laws do not sway the anti-sectarian propagandists. Bulgaria remains the poorest and most corrupt country in the EU, setting a precedent of the government officials embezzling so much of the EU funds that it became the first country to have the EU cut the much of the funding off. We believe that through our web site we are able to be an independent voice against the media and government smoke screen which poisons the minds of people against any religious and charity work Christians do. Youth Club renovations continue – Thus far we have raised about $5,000 for the Vidin youth club renovations. All the funds have been invested in preparing the site for our future outreaches to the youth of the city of Vidin and the orphans/abandoned children with which we still maintain relationship with from Novo Selo and Belogradchik. The club is actually a small house located in the center of the town and had sat derelict for about 10 years. With some tender-love-and-care, a lot of prayer and finances, from donors like yourselves, we hope to be able to finish the repairs, fully furnish the club and have it up and running this winter season. Up to this point we have: removed all old tile work from the stairs, kitchen and bathroom; removed debris, old furniture and ironwork; replaced all the windows and front door with double pane windows and aluminum frames; rebuilt a wall in the kitchen; rewired the entire house and put in a new fuse box; reworked the water outlets and resurfaced all the walls and have had them prepped for painting. Please pray with us that the remaining amount of $4,000-5,000 which we need to finish the repairs and purchase the furniture will come in on time. Recently Yavor read to me the suicide note from a young man who knew a teenage member of our church in Vidin. It read “I cannot forgive this world for the pain and suffering it inflicts.” The youth was a Satan-worshiper who put an end to his life (while in France), desperate and without a reason to live. This tragic ending of a 20 year old life, deceived yet searching for answers, provides a stark reason for us to reach out to the youth with the love and truth of the gospel of Jesus Christ. Prayer for Biser – Many of you know Biser, the young man we meet over 5 years ago when we first started working in the Novo Selo orphanage. He is doing well in the Lord, currently working in Vidin at a home for mentally disabled adults and youth and he needs your prayers on the health-front. For the past year he has had problems with his kidneys, the past several weeks being the worst. He is undergoing tests to determine where exactly the kidney stones are located and what form of intervention can be taken. Please pray for good doctor care and God to open the right doors for his care to move forward. Revelation. Vik and the two older boys, Danny and Matty recently finished an over-a-year-long study of the Book of Revelation. The study was a great opportunity to spend time together and to learn about God from His Word. Family. The boys started a new season of homeschooling. Teresa revamped the curriculum and is making good progress. Even Noah likes to be part of the classroom experience in his own way. At this point we have suspended any immediate plans to move to Vidin. This entry was posted in Missionary Diary on October 27, 2008 by Viktor. An interesting article in English (and a rare one) on the history of Bulgarian missionary and protestant movement. It was written by a Bulgarian journalist for an English langauge expat online newspaper. This entry was posted in Missionary Diary on September 22, 2008 by Viktor. awhile for a suitable living situation in the town of Vidin. mortgage payments than renting a renovated apartment. getting a loan from a bank! problem since it was Vik’s parents who had to sign the papers. joining the effort of the ministry in Vidin up close. us to purchase this property and finally make the move to Vidin. we think we can buy the property. May God move before then! good and is providing for this work! appealing for freedom of religion and speech and media tolerance. in July and August. We had four weeks of great worship services. We are grateful for your prayers. This entry was posted in Missionary Diary, Religious Freedom on August 20, 2008 by Viktor. These pictures show the room whcih the church in Vidin rents and the repairs which we need to do in order to make it more attractive for the church members and visitors. The second half of the photos are from the large room in the same building which we will rent come Aug. 2008 for the Youth Club. We certainly hope that after getting the place fixed it won’t look that bad! Click on the photo below to be taken to view all the photos. This entry was posted in Missionary Diary on July 22, 2008 by Viktor. This is the text of an email Teresa wrote to a friend discussing our search for a place to live in Vidin. Thanks for spending so much time thinking about this for us. I just got an email from Vik (my husband!) entitled: “Five signs that you’re living beyond your means”! And one of the signs is if you’re spending more than 28% of your income on mortgage! Oh well! Anyway, to answer your question about God speaking….yes, he has. Now, it hasn’t been the kind of speaking I’d like to hear, “Yes, this is the house and here is the money,” but then that rarely ever happens. He usually asks us to ‘do something’ and after we do it in faith the means to continue on doing it is always supplied. We’ve seen that even in our move from our previous, smaller apartment to this larger one. Some background: One, Vidin is a small town and housing is harder to find. Little did we know that for that very reason, an apartment, like what we have now in Sofia, is more expensive. This got us praying about buying….though it’s been on the back of my mind for a while now…not Vik’s – he’d be happy with always renting. Two, we’re moving into a deeper relationship with the church out in Wales and more of them will be coming out on short-term missions and even to spend their gap-year (between college and university) serving us in our mission work. We wanted a place that could be used for more guests and events. This also made owning a home more appealing. I won’t add the bit about the boys wanting a yard to run free and wild in…. From God: He has definitely told us to move to Vidin (He’s been speaking about this for the past year)…which from a worldly perspective seems like the stupidest thing one could ever do! Only if you’ve failed at all else would you move there! He has spoken to me out of Isaiah 54:2-3 (to enlarge the place of our tent, stretch out the curtains, do not spare, lengthen our cords, and strengthen our stakes. That we will expand to the left and to the right AND our descendents will inherit the nations AND make the desolate cities inhabited.) Vidin is a desolate city, slowly dying out. Our desire to work with youth is God’s vision to bring life back to the town. He has spoken also out of Is. 55:5 (it’s about calling the youth forth and them running to us because of the Lord God and what he is doing for us). To me, these versus have led me to believe that He is leading us to a larger dwelling place, which here can only mean a house. God has also spoken to me of hidden treasure and how he will provide 5/6 of what we need for this move to Vidin and only 1/6 will come from us. He has also spoken of placing things in the correct order: His forgiveness is first in importance; then his healing; his redemption; his loving kindness and tender mercies; and his provision of our daily needs. This has led me to believe that though we will participate in the expansion of our tent, we need not worry. He takes care of the harder things that cannot be seen and we cannot do ourselves, surely he will take care of our daily needs (like housing). I’ve gotten prayer responses also from three individuals that buying a house seems more of what God is wanting us to do now. I guess, though, we have been overwhelmed with the idea of finances: should we spend so much? Isn’t renting wiser financially? Where can we find the funds? Etc. Wow, I’m feeling convicted as I write this email! We definitely prayed to be led to the right house and for a good connection with the owner. I looked through hundreds of homes and only this one felt right to me. We also connected great with the owner and felt peace in the home. I feel they were open doors. I guess the financial hurdle is hardest for us to get over. I am feeling as I write to you that it would be easier to try here for a loan than in the US. I agree that it would be a big undertaking for you – and one that would tie you up for years. I think we should at least take it to the next level with the bank in Vidin that had better lending rules and see if we pass “go” and can collect 200 hundred dollars! The next level is speaking to the outside expert who will agree or disagree to give us a house quote…the bank is usually hesitant to loan for homes in the country. If she agrees, then we will see what price she’ll pin on the property. It is usually less than the asking price – and the bank can loan only up to 70% of that value. We would then need to find the other 30%. Why don’t we try that and I’ll keep you posted…. This entry was posted in Missionary Diary on July 17, 2008 by Viktor. Remembering without ceasing your work of faith, labor of love, and patience of hope in our Lord Jesus Christ in the sight of our God and Father (1 Thess. 1:3). The words of Paul at the beginning of his letter to the church in Thessalonica expresses the way in which we look forward to our work materializing with the youth club in Vidin. Our work with the youth of the town, as well as the orphaned and abandoned children living in nearby villages, must be a work produced by our faith in the Lord Jesus Christ and not shaped by our desire to be “good” people who do “good” works. The work must also be prompted by our love for the Lord and not driven by our emotions at their state of hardship. And our patience, which will carry us through many a tough season, must be inspired by the hope that we have in the Lord Jesus Christ, otherwise we will surely fail. The Baptist Theological Seminary, in Prague, and the legendary Ph.D.
Viktor was able to spend another two-weeks working on revisions to his Ph.D. dissertation at the BTS Campus in Prague. Getting away from Sofia, and many of his other job duties, has brought him that much closer to the end! He is shooting for an August completion date. We do ask for your prayers for his ability to work quickly and diligently toward this end. Teresa and the kids went along for the ride, literally, and enjoyed every moment using the experience for homeschooling purposes. They were able to visit museums, castles, churches, the zoo, and learned how to use the convenient metro lines to zip about everywhere! Photo from Prague. We published the 16th issue of our online magazine for religious liberty “Freedom for All.” The theme for this month’s issue was: The Bulgarian Law on Religions and the Universal Declaration of Human Rights. The issue was aimed at revising the religious law after five years controversial history of the same in the light of the 60th anniversary of the Universal Declaration. The latter, although a humanistic and pretentious document, has been a source of inspiration for religious liberty and this was a good reason to look into the inconsistencies of the Bulgarian restrictive religious legislature. The four authors include prominent local religious freedom advocate, an Orthodox democratically inclined theologian, an expert on ecumenical law from Berlin, and the former Member of Parliament who actually introduced the bill. Please, pray for our project of translating the web site in English. Our test translations proved that it is very hard to find good translators from Bulgarian to English. In April this year, the mayor’s office in Burgas, one of the two major cities on the Black Sea, and the local police department, issued a letter to all the school principals in the area. In the letter they warned that evangelical Christians are “dangerous sects” who work against the “unity of the nation” by “preaching Jesus” and disregarding the local cultural worship of saints and traditional holidays. Evangelicals were accused of having a Bible different from the Orthodox Bible. The letter stated that if a student or any person is contacted by a “sectarian” they should get in touch with a counselor or the police. (For the text of the official documents in English, read here: http://pastir.org/index.php/archives/52). Viktor got involved in this case by writing an article which was published in a national secular newspaper, Christian web sites and these were widely circulated in various forums. The publicity which was given to this case, as well as by our action, helped the issue be raised in the parliament. An MP of the democratic forces, sympathetic to the plight of the evangelical minority, initiated an official questioning of the Minister of Internal Affairs (the police). This incident happens 17 years after the collapse of communism and regardless of a multitude of laws and commitments of the government to the protection of individual freedoms and religious liberty, in particular. It is a proof how fragile is the concept of Christian freedom before the state in the Bulgarian post-communist society. Viktor is following the situation and is planning further action, possibly legal. Please, pray for wisdom and courage as he moves further into this needed ministry in this part of the world. We will be spending ten days with the church in Vidin next month. Part of our work there will be connected with the youth club and another part will be leading two Sunday services and gathering/encouraging the saints while Yavor (the pastor) is away. Please pray for Vik’s teaching on those two Sundays, God’s leading in both Vik’s and Teresa’s discipleship relations in the church, as well as a greater will, on behalf of the saints of the church, to follow God during times of hardship and testing. Vik will be leading the service on a third Sunday while the pastor is away, but the family will be in Sofia. God’s work is always on time – this is something that we have learned through many pleasant and difficult situations in our lives. Since January we have been looking for a place to move to in Vidin. After facing the disappointing reality that we needed to prepare ourselves to either pay twice as much as what we are paying here in Sofia for an apartment in good condition (which in itself is ridiculous) or paying less, but for an apartment/house needing thousands of leva of repairs to become livable (Bulgarians have this practice of offering their apartments for rent at a slightly lower rate with the clause that the renter do all the repairs necessary to make the place livable). We’ve had a friend scouring the ads in the newspapers and have even had a real-estate agent say that our request (for a 150 sq. m. apartment in decent condition at the price we pay for in Sofia) is an impossibility. The real issue here is trying to be good stewards of the finances God has entrusted us with and not giving in to the greed of the housing market. Well, this is where God needs to make His move on our behalf – after rattling about various ideas it seems that if we are able to get a loan and if we can come up with a down payment of 20%, we will actually be paying less monthly by buying a house than renting an apartment in good living condition in Vidin (which is a city about 320 times smaller than Sofia)! The “ifs” seem BIG at this point, but the timing appears right to us to move forward more radically. We know God wants this move to happen, so please pray for several things: 1) to find the right house to buy; 2) to find a means for getting a loan and other finances necessary to buy; and 3) that all of our searching be in participation with God and not our own efforts. Thank you for your prayers – they are so important to us. Thanks to all of you who pray for us and our ministry. To make a donation visit this web page: http://www.kmission.org/support_us.htm. To be added or removed from our prayer letter list write a note to: vikkostov@kmission.org. This entry was posted in Missionary Diary on June 28, 2008 by Viktor. The Welsh group’s visit and joint outreach was a great blessing to all. We felt that God was building an even stronger connection for future joint ministry. We hope you enjoy the photos! April 2-10. During the second week of April I was able to attend a conference at the Sofia University on “Faith and Reason for Civil Society.” The conference was organized by the philosophy department of the university. Many of the talks were not only scholarly but bitterly noted the chaos in the nation marked by government corruption, ongoing mafia killings in public places and poverty, regardless of certain improvements due to recent EU membership of the country. God opened a door for me and I was scheduled to speak although my name was not initially on the list of conference speakers. I presented a talk entitled “Freedom of Religion as the Foundation of a Free Society.” My thesis was that the fulfillment of the Great Commission of Jesus Christ is foundational for freedom of the individual and that of society as a consequence. I saw some wide opened eyes among the professors of philosophy and their students in the audience, but my sense was that the Holy Spirit had grabbed them and I had their attention. What a great opportunity to speak on the greatness of God’s mission in Christ in the main hall of the atheistic university where I had gone to law school many years ago! In April two young Christian men from Minnesota, traveling throughout Europe, joined us for a couple of days of fellowship and ministry. We took the chance to organize a shoe delivery in a poor gypsy neighborhood (these shoes were initially meant for the orphans in Novo Selo). All went well but the recipients of the shoes got a little bit too excited and caused some chaos toward the end of the outreach. Fortunately no one was hurt. Even the cardboard box which was used to carry the shoes in was taken away! April 20-25. We had the privilege of having Stuart Watkins visit with us again. We put together our usual team of him, myself and Yavor, as the worship leader and a member of the Vidin church, and held church services in Vidin and Silistra (400 miles away). The theme of teaching and ministry was the need to be hungry for God and to have His will done on earth, as it is in heaven. Stuart’s book on practical aspects of ministry, which we are helping publish in Bulgarian, will soon get into the printing house in Silistra. While Stuart was in Vidin, all three of us went to talk to the officials from the Agency for Child Protection Services. We stated that they should look at the reputation our ministry has and not look at the law with the lenses of restriction. The ladies at the meeting, however, were not willing to take responsibility. They offered that we present our request to visit and minister as Christians in the home to them in writing so they can take it to their superiors. Obviously, even though we had a chance to visit the Novo Selo orphan home during the Welsh group visit, we cannot rely on the understanding of the bureaucracy. The weather here is quite funny, quite warm then abruptly very cold. This is very untypical and there is a lot of flu going around. Teresa had fallen quite ill with the flu for about a day or so when we had some prayer time. She had all the symptoms: nausea, dizziness when standing up, aching body, and headache. She lay on the couch during our prayer time. During the worship Noah put his hands together, closed his eyes and prayed: “Jesus, make everything OK, mom healthy, not sick.” After the prayer time he pointed at his mom and said: “You’re well now. Get up!” She tried to tell him that these things don’t happen that fast and that she’s still sick. He just insisted: “Get up.” So she did and within a short time she was feeling dramatically better. Teresa felt so much better that wanted to go on a family adventure somewhere (it was a non-working day here)! Sometimes we need faith like that of a little child (Noah will be three May 19)! A praise report in this area is that the parliament tabled their idea to introduce a limit on the number of members in a religious group which can obtain registration from the government. If you remember, Viktor had written an article criticizing the idea back in January. We’d like to believe that the article contributed to the pressure put on the legislature to back off from this limitation. However, while the central government may be susceptible to the laws on religious freedom, local mayors seem not to care. Last month the mayor in a large town on the Black Sea, along with the police, sent a letter to all public schools to make sure that the students are “protected” from dangerous “sects” including “evangelical Christians.” The letter was fully reminiscent of communist anti-religious propaganda. It caused public outrage among evangelicals but no public apology was offered by the law-breaking mayor. It seems that almost 20 years after the fall of communism things have not changed that much in the way evangelicals are seen by society and government. This makes the ministry of religious freedom quite needed. Thank you for your prayers and support! May God give us grace and strength to keep going! This entry was posted in Missionary Diary on May 6, 2008 by Viktor. This entry was posted in Missionary Diary on May 2, 2008 by Viktor. 1. Folding the orphan ministry. A new beginning at hand. 2. Viktor’s study/ministry trip in Czech, Germany and Romania. 3. The Lord provides a car – thanks for your prayers and contributions. 4. The upcoming Welsh invasion with Romanian participation. 5. Freedom for All: the 15th issue of the online magazine for religious freedom is online. You can pray for the souls of the children and youth who will now remain behind the walls of their “state-run homes” without hope and without immediate Christian spiritual help. This act of ingratitude from the government officials does not come as a surprise. The Lord has been speaking to us to move the youth work to a rented facility in Vidin where in the format of a “youth club” we can provide an environment for ministry outreach. Thus we will not be at the mercy and whim of uninterested bureaucrats as it was with the state-run orphan homes. Please, pray that we will be able to find a proper facility to rent in Vidin and be able to raise the funds for the club. Viktor spent a little over 3 weeks traveling. He was advised by his doctoral committee to visit a seminary in Prague where he could use the library to finalize the dissertation work. It turned out to be a great opportunity for new contacts with Christians from Eastern Europe and such interested in the religious liberty and church and state aspect of our work. I was then able to make the trip to Kempten, Germany, and within 24 hours of my arrival at our friends’ home, to purchase a good second-hand vehicle. It was as if the car was waiting for me! The price was reasonable and within the range of our expectations. We still have to raise 1200 USD to cover the car costs, but we feel like all our prayers and plans came through regarding getting a vehicle that would serve both our family and the ministry. I (Viktor) took the opportunity to visit with a missionary friend from Fuller who teaches at a seminary in Germany. We (I was accompanied by my brother) then visited two ministries in Romania – a Christian publishing house in Timisoara, Romania, and a small church in Hunedoara. We had good fellowship with the brothers in Romania. The practical result of the visit is that a team of three Christians from Hunedoara will join us for the time of the Welsh-Bulgaria mission outreach this week in Vidin. We are also planning a training conference on spiritual growth and character in Hunedoara at the end of April – in our usual team format with Stuart Watkins and Yavor as the worship leader, for the encouragement of the saints there. As of this writing the Welsh spring outreach team is arriving with 31 kids, youth and adults. Teresa has been working hard in the organization of the event by buying supplies and organizing the women’s team in Vidin along with Yavor. We will have 10 days of fellowship and ministry in Vidin – going to the gypsy neighborhood for 2 days of VBS, a team outreach in a home for disable children in a village near Vidin, and “walking the land” (personal evangelism) in three neighboring villages. It is quite unfortunate that the VBS planned to be conducted in the orphan home in Novo Selo will not take place, but there is nothing else we can do. Please, pray for these activities that they will go smoothly and the participants will be relevant and bold witnesses for Jesus. Prayer is needed for the language barrier and cultural differences between the groups as well. Please, pray for Teresa who will manage the cooking for 50 people for 5 evening meals! All of our boys are excited to leave the homeschooling schedule for “ministry vacation” and join the Vidin outreach. In the mean time, Viktor just published the 15th issue of Freedom for All in which 4 authors discuss the introduction of mandatory religious classes in Bulgarian state schools. Please, pray for the translation of the web site into English which we hope to start and finish by September 2008 – for the right translators to be found. Viktor was able to raise the funds needed through the generous giving of two supporters. Thank you for all of your prayers and generous support! This entry was posted in Missionary Diary on March 19, 2008 by Viktor. We arrived in Bulgaria fine but the second leg of the trip Frankfurt – Sofia was hard. During the 10-hour layover in the airport, Teresa and Daniel were hit hard with the stomach flu and our heavy carry-on bags were yet heavier to carry. We had to go three times through security due to changes in the Sofia flight scheduled departure gates. But by God’s grace all bags arrived with us and the meeting party was well organized so we were happy to hit our bed a little after midnight and after over 24 hrs on the road. It has taken us 10 days to recuperate from jet lag and the trip itself. Viktor was able to hit the ground running. The press here published information on the plans of Bulgarian legislature to introduce further limitations in the religious law in the nation. They now want to grant “registration” only to religious groups that meet a certain threshold of membership (over 2,000 or more). Viktor wrote a leading article for the third most influential daily newspaper in the nation critiquing such plans as basically completely turning the registration process for religious groups into a state permit to believe. Below we’ve included a link to the article online (sorry, it is in Bulgarian only). Homeschooling for the boys is back on track, Noah keeps saying “This is our home,” and Viktor will make his first trip to Vidin today to meet with the church there. We are still trying to figure out the car situation so keep this in prayer. Thanks to all of you for your prayers, generosity and love.